With more than 440 theaters in the great state of Minnesota, it’s no surprise that the Twin Cities is home to some of the best productions in America. The jewel in our crown is the Guthrie Theater, which is the largest regional playhouse in the country. But wait, there’s more! 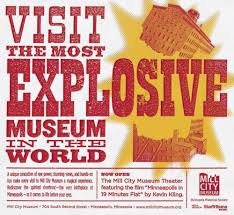 Next door to the Guthrie (which in addition to housing A+ entertainment was also named a ‘must-see’ architectural feat by the L.A. Times) is the Mill City Museum, once the world’s largest flour mill and now a moment in time. At both locations you’ll enjoy spectacular views of the Minneapolis riverfront as you soak up the history and art of Minneapolis. The Guthrie Theater has a long history in Minneapolis opening in 1963 and moving to its current location on June 25, 2006. The Mill City Museum is a National Historic Landmark, known as the Washburn A Mill, it was nearly destroyed by fire in 1991. Faced with the challenge of preserving the ruins of this historically significant site while building a modern museum, the Society turned to Thomas Meyer, principal of Minneapolis architectural firm Meyer, Scherer & Rockcastle, Ltd. Meyer developed a concept that melded the historic integrity of the mill structures with modern components. Construction on the museum began in March 2001. When possible, Meyer’s design has left intact many features of the original mill, including flour bins, milling machinery, the engine house, rail corridor and a wheat house. He also has used limestone, brick, concrete and steel within the museum to emphasize its industrial origins.